Secure your business. Protect your home. 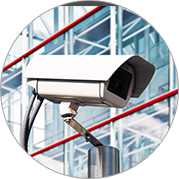 The proactive way to protect your business and home, CCTV is the ultimate deterrent against burglary and vandalism. Offering a wide range of cameras and bespoke tailored systems to suit all budgets and requirements, we work with individual residential properties, warehouses, shops, hotels, care homes, housing associations, landlords letting agents and a raft of other businesses. All our systems are fitted by qualified and experienced engineers and come with training and ongoing support. Your initial expenditure will potentially save you thousands of pounds, and importantly provide your business and family with peace of mind. Don’t be a dummy: Empty cameras don’t fool the savvy 21st-century burglar. Only approved brands will; be a deterrent. Shine a light: Streets in urban conurbations often illuminate homes and businesses so night vision may not be the kind of necessity prevalent in countryside-located properties. Don’t lose the plot: How much ground do you need to cover? Remember, a large plot is a different proposition to a postage stamp garden. Whatever the size and scope of your home or business our experts will provide the best options that meet your requirements.